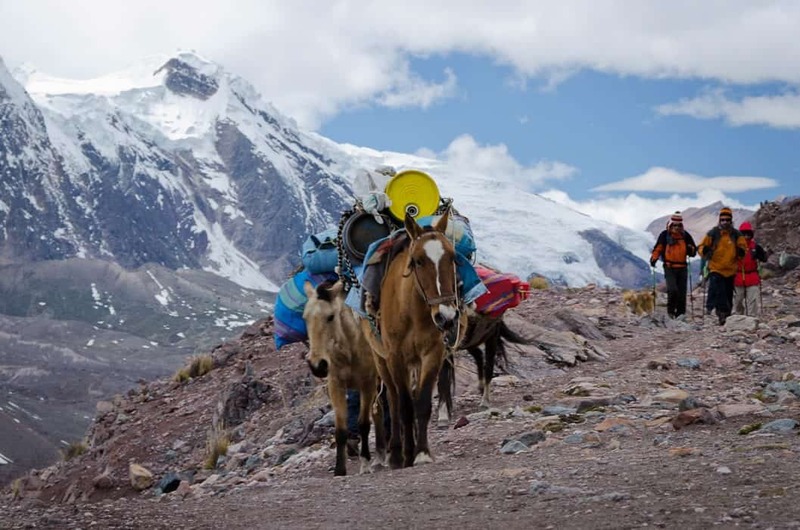 The Ausangate trek route boasts one of the most renowned treks in Peru, yet the trek to Ausangate mountain is still way off the beaten track. On a clear day, Apu Ausangate dominates Cusco’s southern skyline. Situated in the Vilcanota Mountain range about 100km southeast of Cusco, Ausangate mountain is the biggest and most impressive in the region, reaching 6,380m (20,926 ft). On the other side of the range is the Sinakara valley, where the Qoylloriti pilgrimage takes place. Every spring, thousands of pilgrims make the midnight trek by the light of the full moon, and spend four days enjoying the festivities. Our unique 5-day Ausangate trek itinerary gets you into the remote, untouched wilderness of the Ausangate route, long famous for its stunning high altitude scenery, turquoise lakes, and herds of roaming alpacas. Note: due to the high altitude, you must have at least 3 days of acclimatization at high altitude before embarking on the Ausangate trek. Expect to see a wide array of wildlife on the 5D Ausangate Trek, including soaring condors, llamas, alpacas and vicuñas, and possibly an elusive bobcat or puma! You’ll also see majestic snow-capped peaks, glaciers and crystalline turquoise lakes – often right beside your campsite! The chance to bathe in several hot springs along the way will be a welcome trail luxury. Sleeping bags. Available for rent if you don’t have one with you. Sleeping bags good to at least -15˚C are recommended. Extra horse for you to ride, and horseman to lead it. This is in addition to the emergency horse provided for the group. The Ausangate trek is at very high altitude, and you’ll be hiking close to glaciers and snow-covered mountains. Translation: it’s very cold! Temperatures can fall well below freezing at night. We strongly recommend using a sleeping bag good for at least -15˚C (5˚F). This is a totally off-the-beaten path trek, and tourist infrastructure is very limited. Instead, we’ll be making use of local facilities where possible. Please note: this is a true adventure and things may not go exactly according to plan! Keep an open mind and let yourself enjoy the cultural differences you may experience. There is always an opportunity to learn something! We depart Cusco early in the morning for our three-hour ride in private transport to the small village of Tinqui (3800 m / 12,467 ft). We pass through beautiful countryside and several traditional villages including Urcos, Ccatcca, and Ocongate. You will have lunch on route and our Ausangate trek begins! The first 3 hours on the trail are a wonderful prelude to the magnificent scenery of the Cordillera Vilcanota, with great views of Ausangate. From here, we will trek for two hours more until we reach the hot springs at Upis (4400 m / 14,432 ft) which offer fantastic views of Ausangate at the end of the valley. We will camp here for the night. After a hearty breakfast to fuel our morning’s hike, we start walking, eventually crossing the Arapa pass (4700 m / 15,419ft). From here, we continue 3½ hours down the valley, passing the green lake of Puqa Q’ocha (which actually means “Red Lake” in Quechua!) until we reach the turquoise Lake Hatun Puqa Q’ocha (“Big Red Lake”). We then ascend the second pass of Apacheta (4900 m / 16,072 ft) with the turquoise blue Ausangate Q’ocha (Ausangate Lake) below. This stunning lake is fed from the melting snow of Ausangate. We will camp here tonight, under a million stars. Today, we fix our gaze upwards as our morning trek takes us up to Palomani Pass (5200 mt/ 17,060ft), the highest point we’ll reach on this 5-day Ausangate trek. From the Pass, we follow the trail into the valley where we’ll rest and have lunch. During the afternoon we can enjoy views of the snow-capped Tres Picos (“3 Peaks”) and Puca Punta (“Red Point”). 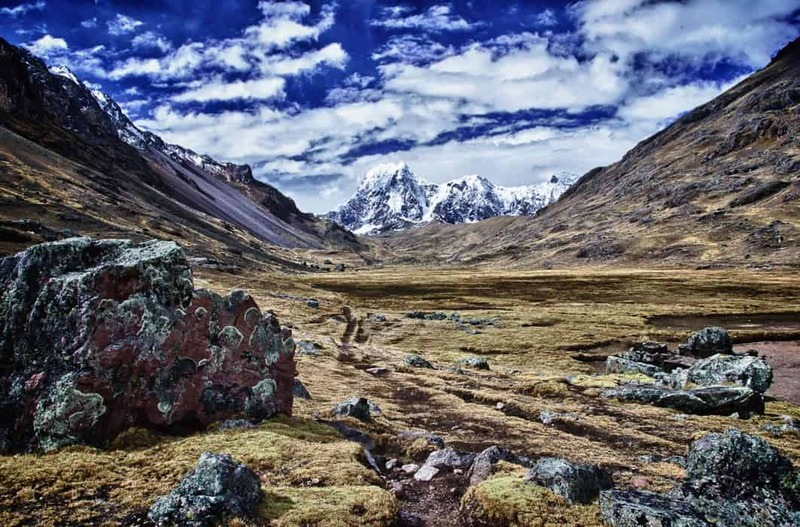 Then, we will continue through the broad green valley of Pampa Jutunpata and up the Q’ampa valley and to Soraypampa, where we will spend the night. We begin today passing through the last pass on this hike, the Q’ampa Pass (5060 m / 16,601ft). Along the way, we will see several different colored lakes and we will have lunch in Nina Parayoc. After lunch, we will continue for several hours, arriving at the small village of Pacchanta in the afternoon. Indulge yourself as you soak in the hot springs for a couple of hours, and even enjoy a well-deserved beer! We will set up camp near Pacchanta and you will have the rest of the day free to explore this interesting Andean village. Note: If you prefer, you have the option of staying in a basic hostel tonight. Our last day on the Ausangate trek, it’s time to take it easy. After a good night’s sleep and another great breakfast, it’s a 3 hour trek back to Tinqui and the trailhead where our journey began. Here, take the time to enjoy this traditional Andean village before we jump back in our private vehicle for trip home to Cusco, arriving back to your hotel around 3pm. I didn’t know what to expect on a guided trek. I expected it to be great, but the five-day trek around Ausangate exceeded anything I had imagined. I can’t say enough about the professionalism of Apus Peru. My traveling is limited, so I greatly appreciated knowing what to expect. Our guide, what can I say? He was great. He has a remarkable sense of people. I never had to worry about a decision that was made on our behalf. On our last night he even had to help a trekker from another group who didn’t hire a professional guide and was struck with altitude sickness. He did everything he could to help. Including sharing oxygen and anti-nausea medication. He took great care of someone who he had no responsibility for. It just highlights the kind of caring person he is. I have actually been having a hard time writing this review because whenever I think about what I want to say, it always sounds way too ” över the top”with gushing compliments. However, it was that kind of trip. Surrounded by an amazing team of people. Thank you Apus Peru, it just doesn’t get any better! The five-day trek around Ausangate stands out as the best single expedition of my long life* of hiking in the Rockies, Appalachians, Alps, volcanoes of Mexico and Andes. From the beginning to the end their excellent staff was in touch with us and responsive to every need or imagined need. Our guide who nearly always leads the Apus Ausangate treks. He therefore knows every village, villager, trail and pass. Our plan was to hike around the mountain but heavy snowfall meant that our guide had to adjust the route for our safety and that of the crew and horses. We still hiked for five days (four nights) and at every turn the scenery changed and a new experience awaited us. There were four of us and it was the first Peru trip for two of us. 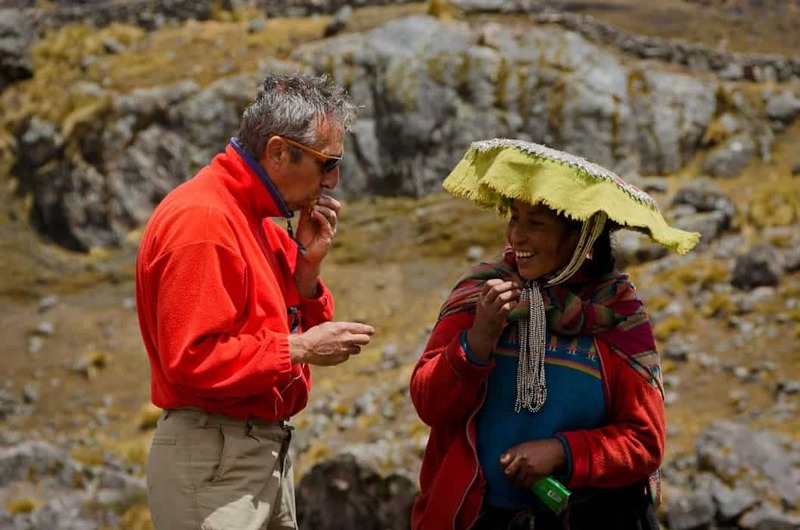 I peppered our guide with questions about Peru – its history, culture, languages, economy. There seemed to be no topic he was unfamiliar with. His humor and warmth were a constant presence; his concern for our welfare and that of the two horsemen and the cook reflected his thorough groundedness as a guide. Our three meals a day were delicious, nutritious, innovative and abundant. The cook, was joyful and entertaining. Apus equipment is top of the line. *Since I am 75 I had to have “special dispensation” to sign up for the trip. I’m told I’m the oldest Ausangate trekker they have handled. I’m planning another trek with my three grandsons as soon as they are old enough!